Researchers at the Department of Energy's Oak Ridge National Laboratory have demonstrated a 120-kilowatt wireless charging system for vehicles—providing six times the power of previous ORNL technology and a big step toward charging times that rival the speed and convenience of a gas station fill-up. ORNL researchers created and demonstrated the world's first 20-kilowatt wireless charging system, which is being modified for applications such as commercial delivery trucks. "It was important to maintain the same or smaller footprint as the previous demonstration to encourage commercial adoption," said project lead Veda Galigekere of ORNL's Power Electronics and Electric Machinery Group. "We used finite element and circuit analyses to develop a novel co-optimization methodology, solving the issues of coil design while ensuring the system doesn't heat up or pose any safety issues, and that any loss of power during the transfer is minimal," he said. 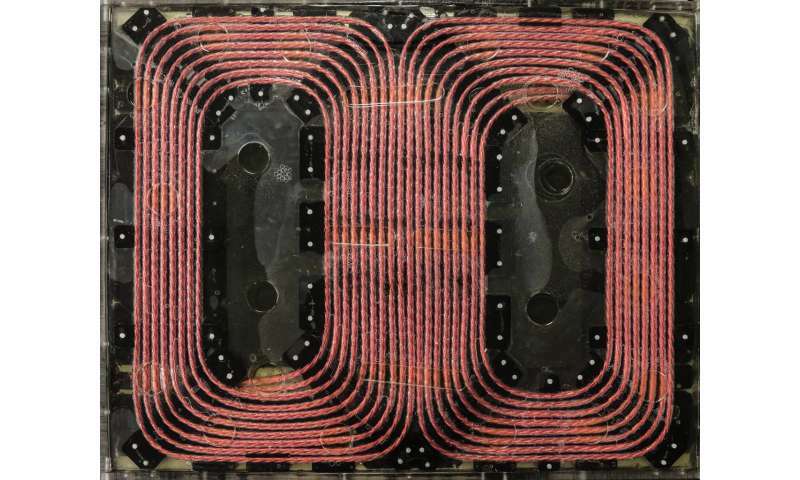 To achieve 120 kilowatts, the ORNL team created a new coil design co-optimized with the latest silicon carbide power electronic devices for a lightweight, compact system. The system's architecture takes energy from the grid and converts it to high-frequency alternating current, which generates a magnetic field that transfers power across a large air gap. Once the energy is transferred to the secondary coil, it is converted back to direct current and stored in a vehicle's batteries. The demonstration advances DOE's extreme fast-charging goal to develop a system that delivers 350 to 400 kilowatts and reduces the charging time for electric vehicles to 15 minutes or less. "This breakthrough significantly advances the technology needed to encourage greater adoption of electric vehicles by increasing their range and the ease of recharging, and in turn supports an energy-efficient mobility system for the nation's economic success," said Moe Khaleel, associate laboratory director for Energy and Environmental Sciences at ORNL. ORNL researchers will explore innovations to increase power transfer level to 200 and eventually 350 kilowatts, while refining dynamic wireless charging technology. 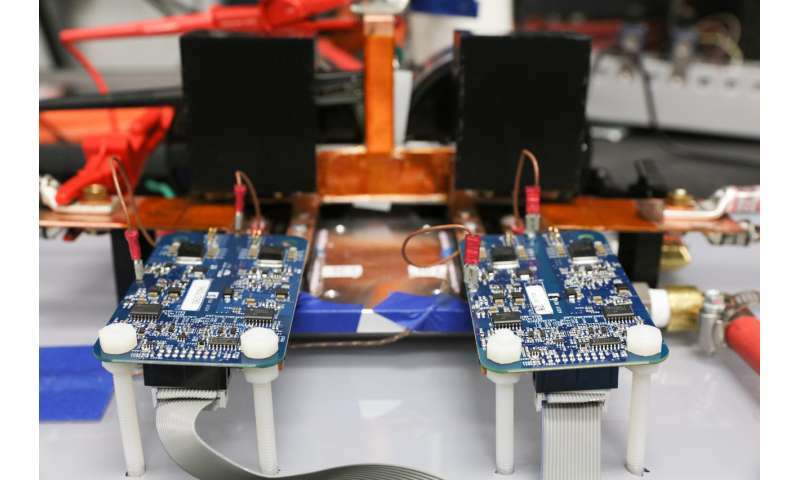 A dynamic system enables the automatic charging of electric vehicles using wireless charging pads installed under roadways. Higher power charging systems are needed to minimize the cost and complexity of dynamic charging. "The goal is dynamic charging at highway speeds," Galigekere said. "high-frequency alternating current, which generates a magnetic field that transfers power across a large air gap"
Put any conductive item in the magnetic field, and watch the eddy currents form. That's one of the problems of these techniques - you put an aluminium gum wrapper between the transmitter and the reciever, and it catches fire from far lower power densities because the alternating magnetic field works like an induction stove on any metallic objects.
" a system that delivers 350 to 400 kilowatts and reduces the charging time for electric vehicles to 15 minutes or less." If the transmitter has to be within 6 inches or less, you might as well plug in a cable and deal away with all the complexity. And, a regular gasoline pump can deliver 3.5 to 4 MW of power in terms of energy delivered to the vehicle. 15 minutes at the pump is a really long time, and an individual service station can't deal with multiple customers at the same time for the limits of how much power they can draw from the grid, so there's going to be a long line to the chargers anyhow. I'm generally not a fan of wireless charging, but this seems sensible. It might be technically complex, but it's physically simple, which may make it quite robust and reliable. It has no moving parts and the driver doesn't even have to touch it to charge the vehicle. Just pull up and charge. 15 minutes at the pump is a really long time, and an individual service station can't deal with multiple customers at the same time for the limits of how much power they can draw from the grid, so there's going to be a long line to the chargers anyhow. The paradigm is changing. Service stations exist because of the special handling required by gasoline. Electricity is ubiquitous, charging stations of various power levels can be practically anywhere. Any business should be able to turn some parking spaces into charging stations. 15 minutes is not unreasonable while at a coffee shop or store. Car parks will likely offer trickle charging to customers, wireless or wired. Taking on energy will become opportunistic for many drivers instead of a chore that must be done when the tank gets low. Eikka good points but ignoring the reality of gassing your car. "... a regular gasoline pump can deliver 3.5 to 4 MW of power in terms of energy delivered to the vehicle. 15 minutes at the pump is a really long time, ..."
One of the kids and your wife need to use the toilet. The other kids are scooping up snacks and toys. You are trying to get a jammed card reader to accept your charge. 15 minutes? Hah! Not in this universe. And by the way. Those megawatts of energy from gasoline? How much of that does your vehicle actually use as power? A megawatt or less? The rest hopefully poisons an expensive catalytic converter. Plus a whole lot of waste heat is chronically degrading your investment in the machinery. People who compare charging to pumping gas are stuck in some kind of mental rut. Pumping gas: You need to do this when your tank is empty. No matter if you drove 1km each day for hundreds of days or all of your tank capacity in one go. Charging: You charge over night, at your workplace or while shopping. You NEVER have to go to a charging station where you have to wait UNLESS you are driving more than the maximum capacity of your battery in one go (which is exceedingly rare for most people). Charging time is completely irrelevant almost all of the time. Even those days where you have a long-ish trip this will mean one reststop (which you'll take anyways). It doesn't matter whether you charge in 5 minutes or 30. The charging plate idea has its pros and cons. It reduces complexity in how the user interacts with the charging station (less chance for things to break, which means less maintenance costs of the charging points). But I don't see the how this could be made universal. Making all car manufacturers adhere to one standard has never really worked in the past.